"The strength of the working class is organization. Without organization of the masses, the proletarian is nothing. Organized it is everything. Being organized means unity of action, unity of practical activity." 1925's Strike was legendary director Sergei Eisenstein's first full-length feature film, and he would go on to make his masterpiece The Battleship Potemkin later that year. Strike was acted by the Proletcult Theatre, and composed of six different parts, as it originally was intended to be one part of a seven-part series, entitled Towards Dictatorship (of the proletariat), that was left unfinished. Strike was one of the first major films of the Soviet Montage movement and it is a highly political propaganda film with strong statements about collectivism. The film depicts a strike in the year 1903 by the workers of a factory in pre-revolutionary Russia, and explores the labourers tension, hardship and subsequent suppression which was endured by the controlling class. Soviet director Sergei Eisenstein was a student of the Kuleshov school of film-making and advocate of the theories of Soviet montage, which were a series of shots that formed conflict, collision and shock, which he believed was much more effective in emotionally affecting the viewer. Doing this Eisenstein would manipulate the viewer in feeling sympathy for the courageous workers and hatred for the corporate greedy business men. Eisenstein also experimented with a theory called Intellectual Montage which was considered a style of editing that could form a relation or meaning between two separate images created from juxtaposition, and have them form new ideas, metaphors or symbols to the shots. These theories were greatly used in Strike, as Eisenstein cuts between the poor and determined faces of the citizens getting raided by police officers, to the meetings of the greedy fat corporate shareholders drinking wine, laughing and clenching their cigars with their fat fingers, creating an contrasting argument for the injustice that the workers are receiving by the greedy higher class. The film is most famous for a legendary sequence near the end of the film which cross-cuts with footage of the Soviet police shooting and killing civilians that are trying to retreat from them off-screen, while the scene cuts back and forth to a slaughterhouse where a butcher is holding a knife to a cow’s throat right before slaughtering it. Those two images juxtapose to form a third meaning between the cow and the civilians as the series of shots of the deceased and murdered civilians sprawled on the ground runs parallel to the cow's throat being brutally slashed open with a knife, as the cow slowly bleeds to death. Eisenstein’s theory of Intellectual Montage has the viewer make a connection between the murder of the civilians and the cow, which creates a third meaning for the viewer suggesting that the massacre of the civilians was more like a helpless slaughter. These violent and intense juxtaposed montage sequences can be looked at as the aesthetic starting point which inevitably led to other thrilling sequences, most famously with villagers ceremonially slaughtering a water buffalo in Frances Ford Coppola's war epic Apocalypse Now. Using typography, the word "HO" (but) is added to the title of the chapter which then animates and dissolves into an image of machinery in motion. The administration is spying on the workers, reviewing a list of agents with vivid code names which all resemble animal names: The Monkey, The Bulldog, The Fox, The Shepherd, The Owl, ect. Vignettes are shown of each of them as the shot of each spy is juxtaposed with an image of their description. Conditions are tense with agitators and bolsheviks planning a strike prior to the catalytic event. A micrometer is stolen, with a value of 25 rubles or 3 weeks pay. A worker, Yakov, is accused of the theft and subsequently hangs himself. Fighting ensues and work stops. The workers leave the milling room running and resistance is met at the foundry. The strikers throw rocks and loose metal through the foundry windows. Then locked within the gates of the complex, the crowd confronts the office. They force open the gates and seize a manager carting him off in a wheel barrow dumping them down a hill into the water. The chapter begins with footage of ducklings, kittens, piglets, and geese. A child then wakes his father for work ironically with no work to do, they laugh and frolic. The factory is shown vacant and still with birds moving in. The children act out what their fathers had done, wheelbarrowing a goat in a mob. The owner is frustrated by orders arriving and the frozen plant. Demands are formulated: an 8 hour work day, fair treatment by the administration, 30% wage increases, and a 6 hour day for minors. The shareholders get involved with the director and read the demands. They discuss dismissively while smoking cigars and having drinks. Presumably on the orders of the shareholders, the police raid the workers, and they sit down to protest. At their meeting the shareholders use the demand letter as a rag to clean up a spill, and a lemon squeezer metaphorically represents the pressure the stockholders intend to apply to the strikers. Scenes are shown of a line forming at a store which is closed, and a baby needing food. A fight occurs at a home between a man and a woman, subsequently she leaves. Another man rummages through his home for goods to sell at a flea market, upsetting his family. A posted letter publicly shows the administrators rejection of the demands. Using a hidden camera in a pocket watch, a spy named "Owl" photographs someone stealing the letter. The pictures are transferred to another spy. The man is beaten, captured, and beaten again. The scene opens with dead cats dangling from a structure. A character is introduced, "King" whose throne is made of a derelict automobile amidst rubbish, and who leads a community that lives in enormous barrels buried with only their top openings above ground. After a deal with a tsarist police agent, "King" hires a few provocateurs from among his community to set fire, raze, and loot a liquor store. A crowd gathers at the fire and the alarm is sounded. The crowd leaves to avoid being provoked but are set upon by the firemen with their hoses regardless. The governor sends in the military. A child walks under the soldiers' horses and his mother goes under to get him and is struck. Rioting commences, and the crowd is chased off through a series of gates and barriers heading to the forge, then their apartments. The crowd is chased and whipped on the balconies. A policeman raises and drops a child from the balcony, killing it. 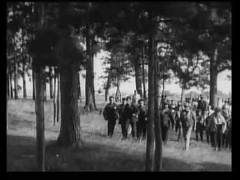 The workers are driven into a field by the army and shot en masse, this is shown with alternating footage of the slaughtering of a cow. Soviet director Sergei Eisenstein wrote Battleship Potemkin originally as a revolutionary propaganda film, but also to test his theories of Soviet Montage. Montage is a synonym for a form of editing which was practiced by Soviet filmmakers Lev Kuleshov, Vesvolod Pudovkin, Dziga Vertov and Sergei Eisenstein around the 1920s at the Kuleshov school of film-making. Each filmmaker incorporated their own forms and ideologues of Soviet Montage differently into their films under the teachings of Lev Kuleshov, placing these ideas into political concepts. Eisenstein called these different forms ‘Cinema of Attractions’ and experimented with a form of film editing which attempted to produce the greatest emotional response in a viewer by conflicting two different shots side created from juxtaposition. Soviet Montagists took the work of editing away from mere exposition and focused on materialization of ideas, motifs, symbols, metaphors, themes, and concepts through editing. In formal terms, Soviet Montage's style of editing offers discontinuity in graphic qualities, violations of the 180 degree rule, and the creation of impossible spatial matches. It is not concerned with the depiction of a comprehensible spatial or temporal continuity as is found in the classical Hollywood continuity system. It draws attention to temporal ellipses because changes between shots are obvious, less fluid, and non-seamless. Eisenstein describes five methods of montage in his introductory essay 'Word and Image'. These varieties of montage build one upon the other so the higher forms also include the approaches of the "simpler" varieties. In addition, the "lower" types of montage are limited to the complexity of meaning which they can communicate, and as the montage rises in complexity, so will the meaning it is able to communicate (primal emotions to intellectual ideals). It is easiest to understand these as part of a spectrum where, at one end, the image content matters very little, while at the other it determines everything about the choices and combinations of the edited film. Eisenstein's montage theories are based on the idea that montage originates in the "collision" between different shots in an illustration of the idea of thesis and antithesis. This basis allowed him to argue that montage is inherently dialectical, thus it should be considered a demonstration of Marxism and Hegelian philosophy. His collisions of shots were based on conflicts of scale, volume, rhythm, motion (speed, as well as direction of movement within the frame), as well as more conceptual values such as class. Metric - where the editing follows a specific number of frames (based purely on the physical nature of time), cutting to the next shot no matter what is happening within the image. This montage is used to elicit the most basal and emotional of reactions in the audience. Metric montage example from Eisenstein's October. Rhythmic - includes cutting based on continuity, creating visual continuity from edit to edit. Another rhythmic montage example from The Battleship Potemkin's "Odessa steps" sequence. Tonal - a tonal montage uses the emotional meaning of the shots—not just manipulating the temporal length of the cuts or its rhythmical characteristics—to elicit a reaction from the audience even more complex than from the metric or rhythmic montage. For example, a sleeping baby would emote calmness and relaxation. Tonal example from Eisenstein's The Battleship Potemkin. This is the clip following the death of the revolutionary sailor Vakulinchuk, a martyr for sailors and workers. Overtonal/Associational - the overtonal montage is the cumulation of metric, rhythmic, and tonal montage to synthesize its effect on the audience for an even more abstract and complicated effect. Overtonal example from Pudovkin's Mother. In this clip, the men are workers walking towards a confrontation at their factory, and later in the movie, the protagonist uses ice as a means of escape. Intellectual - uses shots which, combined, elicit an intellectual meaning. Intellectual montage examples from Eisenstein's October and Strike. In Strike, a shot of striking workers being attacked cut with a shot of a bull being slaughtered creates a film metaphor suggesting that the workers are being treated like cattle. This meaning does not exist in the individual shots; it only arises when they are juxtaposed. At the end of Apocalypse Now the execution of Colonel Kurtz is juxtaposed with the villagers' ritual slaughter of a water buffalo. Intellectual Montage would make the viewer think more deeply about the connection between two separate images having them form new ideas, metaphors or symbols to the shots. The general trajectory between Intellectual Montage is Perception, Emotion, and Cognition. Eisenstein’s theory was based on a Japanese ideogram in which he created a third meaning within two separate shots which were the sum of all greater parts. For instance, a shot of a bird and a mouth would form a third meaning to the viewer which was to sing. The shots of an eye and water would form meanings of crying and the shots of a baby and a mouth would form the meaning of screaming. Drawn from the Marxist philosophical precept in which Dialectics=Thesis & Antithesis which = Synthesis. For example: Bourgeois/tsarist (thesis)+proletariat (antithesis)=outcome of classless society/revolution (synthesis). Eisenstein’s style of Intellectual Montage is very similar to Kuleshov's original theory called the Kuleshov Effect. The Kuleshov Effect was a experiment demonstrated in the 1910s and 20s where filmmaker’s recutted old footage of a close-up of actor Ivan Mozhuchin and repeatedly cut shots of other material like a bowl of soup, a crying baby or a dead woman’s body. Audiences would look at the same footage of Ivan Mozhuchin followed by a different shot and would bring a different conclusion to what they had to say about the scene. Eisenstein’s Intellectual Montage brought the power of editing to an even greater level and not only had the audience create different conclusions on what they saw on the screen, but they would create deeper symbolic meanings and metaphors that went outside the context of the film. In his later writings, Eisenstein argues that montage, especially intellectual montage, is an alternative system to continuity editing. He argued that "Montage is conflict" (dialectical) where new ideas, emerge from the collision of the montage sequence (synthesis) and where the new emerging ideas are not innate in any of the images of the edited sequence. A new concept explodes into being. His understanding of montage, thus, illustrates Marxist dialectics. Concepts similar to intellectual montage would arise during the first half of the 20th century, such as Imagism in poetry (specifically Pound's Ideogrammic Method), or Cubism's attempt at synthesizing multiple perspectives into one painting. The idea of associated concrete images creating a new (often abstract) image was an important aspect of much early Modernist art. Eisenstein relates this to non-literary “writing” in pre-literate societies, such as the ancient use of pictures and images in sequence, that are therefore in "conflict". Because the pictures are relating to each other, their collision creates the meaning of the "writing". Similarly, he describes this phenomenon as dialectical materialism. Eisenstein argued that the new meaning that emerged out of conflict is the same phenomenon found in the course of historical events of social and revolutionary change. He used intellectual montage in his feature films (such as Battleship Potemkin and October) to portray the political situation surrounding the Bolshevik Revolution. He also believed that intellectual montage expresses how everyday thought processes happen. In this sense, the montage will in fact form thoughts in the minds of the viewer, and is therefore a powerful tool for propaganda. Intellectual montage follows in the tradition of the ideological Russian Proletcult Theatre which was a tool of political agitation. In his film Strike, Eisenstein includes a sequence with cross-cut editing between the slaughter of a bull and police attacking workers. He thereby creates a film metaphor: assaulted workers = slaughtered bull. The effect that he wished to produce was not simply to show images of people's lives in the film but more importantly to shock the viewer into understanding the reality of their own lives. 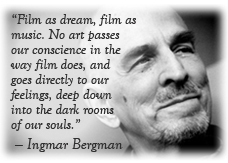 Therefore, there is a revolutionary thrust to this kind of film making. Eisenstein discussed how a perfect example of his theory is found in his film October, which contains a sequence where the concept of "God" is connected to class structure, and various images that contain overtones of political authority and divinity are edited together in descending order of impressiveness so that the notion of God eventually becomes associated with a block of wood. He believed that this sequence caused the minds of the viewer to automatically reject all political class structures. These five styles of Soviet Montage’s Cinema of Attractions has been influential for several future filmmakers’ as you still see forms of Soviet Montage being used in many present films today, most famously with Alfred Hitchcock's Psycho and Francis Ford Coppola's The Godfather. Pudovkin's theory was in support of larger narrative action and of a series of linkage between shots. Vertov focused on rhythm in editing, and celebrated on how the eye of the camera recorded reality in contrast to the human eye. Sergei Eisenstein’s theory of montage is the most complex and most interesting of styles. Eisenstein developed three different forms of Montage. The first was Perceptual Montage which is a way of editing that would shock and affect the viewer. The second was Associational Montage which were comparisons or associations made through the sum of the shots. One of the basic artistic precedents to the Soviet Montage movement was Russian Constructivism which was an art that fulfilled a clear social function and is not autonomous involving such artistic merits as architecture, graphic design and the theater. Constructivism incorporates the effect of technology and the industry on abstraction of forms such as the craftsman-worker (not genius or visionary.) The purity of geometric shapes such as lines and volumes communicates ideas more sharply, as the art becomes harnessed to social function and abstraction or utility. The artwork as machine within Constructivism counters the notion of art as organic, as art is seen as a synthesis between the dialectic nature and the industry/science which is seen in director Sergei Eisenstein's writings. Constructivism refutes and challenges the notion of composition of passive decorative elements, which is a more direct construction of materials, or a manipulation of materials, as its component parts are activated and assembled, montage as "putting together." The basic idea of Russian Constructivism is influenced by French Cubism & Italian Futurism, but these predecessors are not as overtly political as the Constructivist movement. Russian Constructivism and these theories of Soviet Montages were greatly used in Battleship Potemkin, whether its the furious citizens yelling "Down with the tyrants!" and the shot is cut to clenched fists, or the captain threatening to hang mutineers from the yard, as the scene cuts to ghostly figures hanging from there. But the greatest uses of Soviet Montage are in the infamous Odessa Staircase massacre sequence, as director Sergei Eisenstein cuts between the frightened faces of the unarmed citizens, and then to the faceless troops with weapons, creating a contrasting argument for the people against the tsarist/czarist state. Other examples of this theory can be seen in this sequence whether its the defenseless civilians who are unable to flee and the cut to the citizen without legs, A military boot crushing a child's lifeless hand and body and the horrifying reaction of the child's helpless mother, a nurse with a pair of Pince-nez, but when the shot returns back to her the Pince-nez has been pierced by a bullet. And the most famous scene in this sequence (which was homaged most famously in Brian D Palma's The Untouchables) when a mother is fatally shot while pushing an infant in a baby carriage and slowly falls to the ground pushing the baby carriage down the steps while it cuts to the violent slaughter of its fleeing crowd. Eisenstein purposely used his editing techniques of Soviet Montage and the linkage and collision of shots as practical weapons as Eisenstein said in his own words: "solve the specific problem of cinema, and challenge audiences to experience ideas, emotions and sensations while being engrossed within a story." Eisenstein put his techniques to full use with Battleship Potemkin, emotionally manipulating the audience in such a way as to feel sympathy for the rebellious sailors of the Battleship Potemkin and a emotional hatred for their cruel overlords. In the manner of most propaganda, the characterization is simple, so that the audience could clearly see with whom they should sympathize. The massacre on the steps, which never took place, was presumably inserted by Eisenstein for dramatic effect and to purposely demonise the Imperial regime. before filming of the third part could be finished. The story of Strike begins with Sergei Eisenstein's brilliant and shocking series of editing and beautifully placed composition, to the running and movement of the factory and its workers, which he perfectly masters in his next film Battleship Potemkin. This film is simply a political propaganda film about the awful working conditions of the everyman in 1903 during the pre-revolutionary time in Russia, with strong statements about collectivism, hoping the film would inspire audiences. The story really gets started when one of the employees named Yakov reports to the administration that a micrometer with a value of 25 rubles was stolen. Montage is brilliantly used to demonize the administration, as the editing cross-cuts between Yakov reporting the matter, and the laughter that he receives by the administration. The scene brilliantly juxtaposes between a close-up shot Yakov and of the administration manager, presenting to the viewer the manager falsely accusing Yakov. The third meaning that could be developed from both of those images is that the administration manager is accusing the spectator as well, because he have developed sympathy for poor Yakov. When Yakov realizes he is being falsely accused of the theft he subsequently hangs himself leaving a letter for his comrades: "Comrades, the boss has accused me of theft. I am not guilty but cannot prove it. I refuse to bear the stigma of a thief, so I have decided to end my life. Goodbye and remember that I am not guilty. Yakov Strongen." The workers finally had enough of the inhuman ways they are being treated and stampede through the milling room and out into the foundry telling everyone to stop working immediately, and that they're going on strike. There is a humorous scene of them taking one of their managers and wheel-barrowing him outside dumping him into the water. Ironically that scene is later paralleled by the factory workers children acting out what their fathers did by wheel-barrowing a goat. Strike focuses not only on the workers political fight but of the administration and of their crooked spies. Their is a subplot of one particular spy named Owl whom takes some photographs which eventually gets into the hands of another spy who gets caught and beaten in the street when his identity is discovered. There is an interesting sequence near the beginning of the film which explores the administration cataloging all of their spies, and presents to the spectator a list of all the spies code names, several of them being animal names: The Monkey, The Bulldog, The Fox, The Shepherd, The Owl, ect. Vignettes are shown of each of them as the shot of each spy is juxtaposed with an image of the animal of their description, which I found highly fascinating. The quite moments when the workers are on strike opens with several different animals like ducklings, kittens, piglets, and geese and the vacant factory with only birds, and a stray cat, as the machines are no longer in motion. While the workers are on strike Eisenstein presents many of the workers daily activities of boredom, like sleeping in, arguing with their wife, being awakened by their baby, and even some of these men scraping by with the little money they have to buy food to feed their family. In one of the most fascinating parts of the film the director of the company is gleefully laughing, smoking cigars and having drinks in his office with several other upper-class shareholders, as they discuss the demands the workers have set for themselves. Demands are made which includes an 8 hour work day, 30% wage increases, and a 6 hour day for minors. The shareholders read the demands and decide to not go with them. Eisenstein perfectly captures the look of fat, greedy, capitalistic pigs with the way he portrays the District Manager and all the shareholder businessman, their fat finger clenching their cigars. There is a brilliant scene of montage in this sequence which juxtaposes a violent police raiding a mob of protesting workers, while the businessmen gleefully laugh developing a third meaning which is that the Director of the company or the shareholders tend to not care about the workers or their proposition. This sequence becomes even more obvious when the proposal letter that the workers written is simply used to clean up a wine spill, which gives the spectator a greater idea of the injustice that is being done to the workers. There is also a scene which Eisenstein emphasizes the pressure the stockholders intend to apply to the strikers, as you watch a shareholder struggle with an lemon squeezer as the sequence shifts back and forth between the trampling police horses and of the juice of the lemon slowly trickling out from the machine. I look at Strike as a similar companion piece to his 1928 film October, which celebrates the dramatization of the 1917 October Revolution, and its themes are slightly similar to those of Strike. They're also several metaphors of animals that Eisenstein uses a lot in Strike that he also in October, (In that film a horse is shot and killed and hangs from an opening bridge) in which the violent brutality of its animals greatly mirrors the violent oppression of the people. The final violent climax in Strike is powerfully devastating and slightly disturbing. They're two key moments in the film that slightly disturbed me. The first sequence was of the military police getting involved and chasing its crowd off through a series of gates towards their apartments. The crowd is chased and whipped on the balconies and a policeman horrifically drops an infant from a two story balcony, killing it. The other sequence that disturbs me is the legendary cow slaughtering sequence of the film which Strike is mostly famous for. The film cross-cuts with footage of the Soviet police shooting and killing civilians that are trying to retreat from them off-screen, while the scene cuts back and forth to a slaughterhouse where a butcher is holding a knife to a cow’s throat right before slaughtering it. Those two images juxtapose to form a third meaning between the cow and the civilians as the series of shots of the deceased and murdered civilians sprawled on the ground runs parallel to the cow's throat being brutally slashed open with a knife, as the cow slowly bleeds to death. 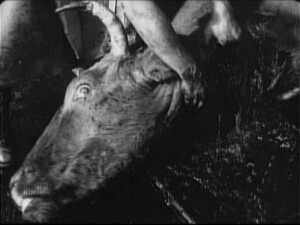 Eisenstein’s theory of Intellectual Montage has the viewer make a connection between the murder of the civilians and the cow, which creates a emotional third meaning for the viewer suggesting that the massacre of the civilians was more like a helpless slaughter. These violent and intense juxtaposed sequences can be looked at as the aesthetic starting point which inevitably led to other thrilling sequences most famously with the villagers ceremonially slaughtering a water buffalo in Frances Ford Coppola's war epic Apocalypse Now. Strike is a great film that I believe is slightly overshadowed by Battleship Potemkin, as I thought several of its montage sequences in this film were much more effective and fascinating. The brilliant forms of juxtaposed montage Eisenstein creates throughout this film is absolutely spellbinding and the aesthetics of Intellectual Montage has been used in later classic films like in the iconic baptism sequence in Frances Ford Coppola's The Godfather and in the classic 'Dawn of Man' sequence in Stanley Kubrick's 2001: A Space Odyssey.